You are an elite soldier, your jet fighter was destroyed in an intense air battle and you eject right into the middle of enemy territory. How long can you survive the waves of helicopter's sent to kill you? 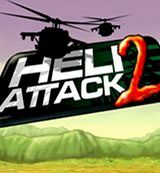 The aim of the game is to get the highest score possible by destroying wave upon wave of helicopters, do this by avoiding the enemies fire, while shooting him yourself. Move using the left or right key (default) and use the mouse to aim, click the mouse button to shoot your weapon. Your soldier can jump with the up key (default), and you are able to jump once more again in the air. Use hyperJump to get above the helicopter and take him down to get a random weapon. Use timeDistort to slow down time and give yourself longer to react. Collect weapons and powerups to help you along the way. Good Luck.